This is a designer ornament handmade by artists at the Glass Eye Studio in Seattle, Washington. The glass is recycled and contains ash from the 1980 Mt. St. Helen's eruption. 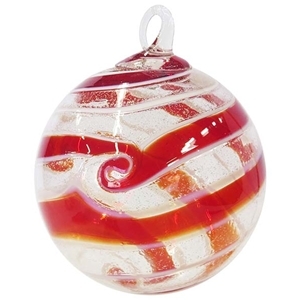 This piece has a clear and red candy cane swirl with sparkly flecks in the clear areas and occasional twists in the spiral. Its diameter is approximately 3"+.